Feeling Stitchy has featured some unique and inspiring cross stitch. 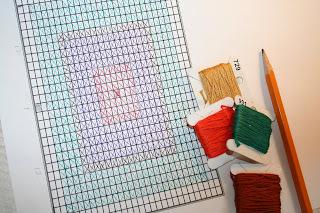 A fun and easy way to design your own original cross stitch is to use graph paper. Listed below are links to help you get started with a project. - Patternpatch provides the directions for mapping out your design on graph paper. - Needlepointers provide free printable graphs. Incompetech does as well but also lets you specify the number and size of the squares. - Check out Yarntree's Learn to Cross Stitch in 5 Minutes plus its shop where you can find tons of supplies. 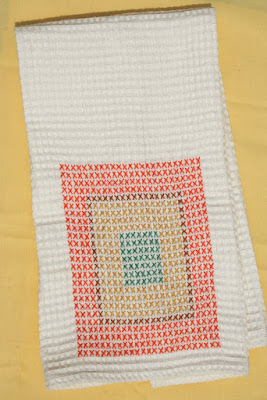 - There is a great cross stitch tutorial at Primrose Design. - Create your own chart with a chart generator at Dark Lilac. If you have a great resource for cross stitch or other embroidery projects, let us know! 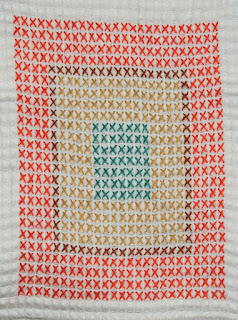 I love your design, Amy, and that you used the waffle weave as a graph - such a great idea!